So long, cereal and toast! It’s time to kick your breakfast up a notch, with our new breakfast items, available everyday from 5-11AM! 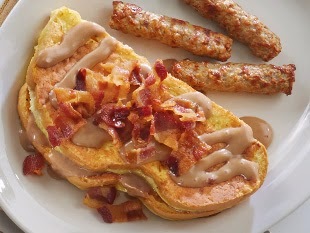 One of the greatest creations to hit the breakfast world, this delectable dish is prepared with our house-baked Italian bread, filled with maple bacon icing and then garnished with even more bacon and icing. It’s served with your choice of sausage, turkey sausage, or bacon for just $5.99. This is one burrito you won’t want to miss boasting scrambled eggs, chopped bacon, ham, Parma Chorizo, caramelized onions, pepper Jack cheese, and chipotle sauce all stuffed into a delicious tortilla. 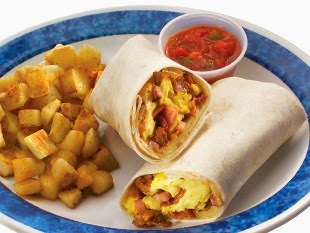 It’s served with salsa on the side and your choice of breakfast potatoes for $6.99. 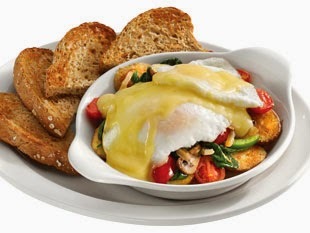 A vegetable lover’s dream, this stack features fresh spinach, tomatoes, mushrooms, peppers, and caramelized onions mixed with our grilled home fries and topped with two over-easy eggs and our hollandaise sauce. It’s only $6.99 and is served with toast. The perfect way to add some spice to your morning, this stack includes a heaping helping of green peppers, onions, and Parma Chorizo over our grilled home fries and topped with two over-easy eggs and Sriracha hollandaise sauce. 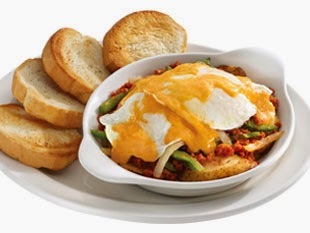 It’s served with toast for $7.99 and is sure to put a little pep in your morning step! For a limited time only, we’re offering our Original Breakfast Smile for only $3.99 with a beverage purchase from 5-11 AM, Monday through Friday! 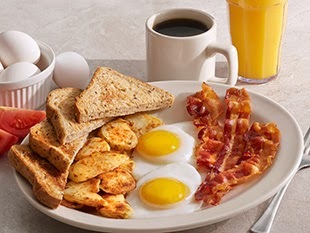 Imagine two eggs, your choice of three pieces of bacon, sausage, or turkey sausage, breakfast potatoes, and toast, all for one low price! It doesn’t get any better than that.